There are a number of ways you can listen to Manx Radio via your radio in the Isle of Man, worldwide via the RadioPlayer and, when you’re on the move anywhere in the world, through the iPhone and Android apps. Manx Radio’s main service is on FM and transmitted from five transmitters at sites around the Isle of Man. For technical reasons each transmitter uses a different frequency. Our FM network is designed to primarily target the population of the Isle of Man. All the FM transmissions are in stereo and carry the Radio Data System (RDS) station identifier of "MANX FM". Because of the very hilly nature of the Island there are pockets of unpredictable reception, particularly on the fringes of these areas. If the recommended frequency does not give clear reception, try the others and judge for yourself which is best. Our AM network is primarily used to provide alternative programming such as the famous Manx Radio TT and our comprehensive Isle of Man Festival of Motorcycling coverage. However, it is also used to provide broadcasts from the Island’s Parliament, Tynwald and Question Time from the House of Keys. The network is also used for Manx language programming and other opt-outs from our main FM service. Programming broadcast on our main FM service can also be heard on the AM frequency 1368 unless we are providing a choice of listening. Full details of the programming on both networks can be seen on the Programme Schedule in this website and are comprehensively publicised on Manx Radio. As well as being heard in the Isle of Man, the AM service is also audible in Southern Scotland, in the North West, in North Wales and in the West of Ireland and Northern Ireland. 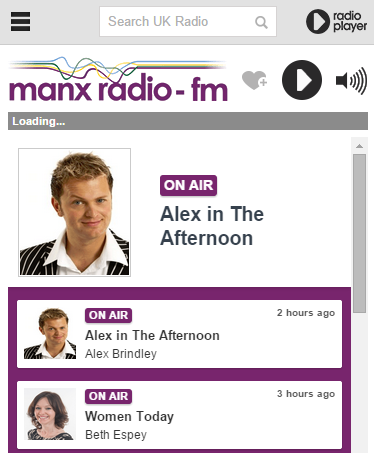 Streaming audio of our broadcasts is also available via manxradio.com. 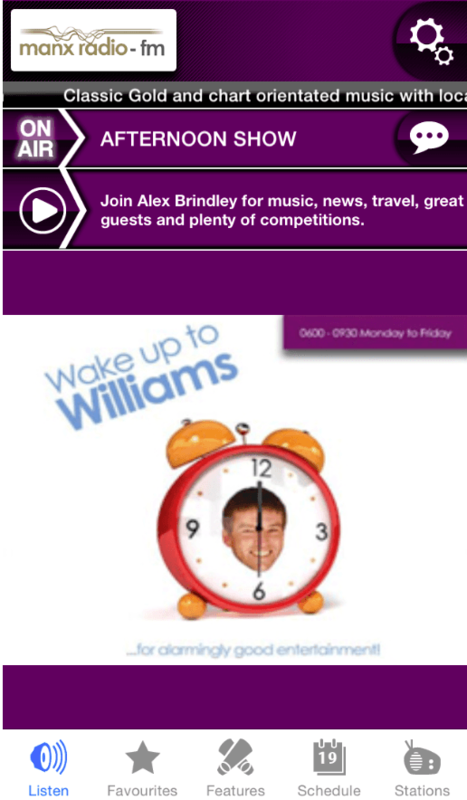 Both our FM and AM services are available via the Listen Live button on manxradio.com and the service is available via a high quality stereo stream enabling the best quality listening of the programming that is solely broadcast on our AM service. The RadioPlayer also provides a host of Manx Radio services and gives easy access to a number of Manx Radio services such as up to date News and Weather. It also provides a simple way to contact the station directly. All of Manx Radio’s services are also available in high digital quality on iPhone and Android phones in high stereo quality.